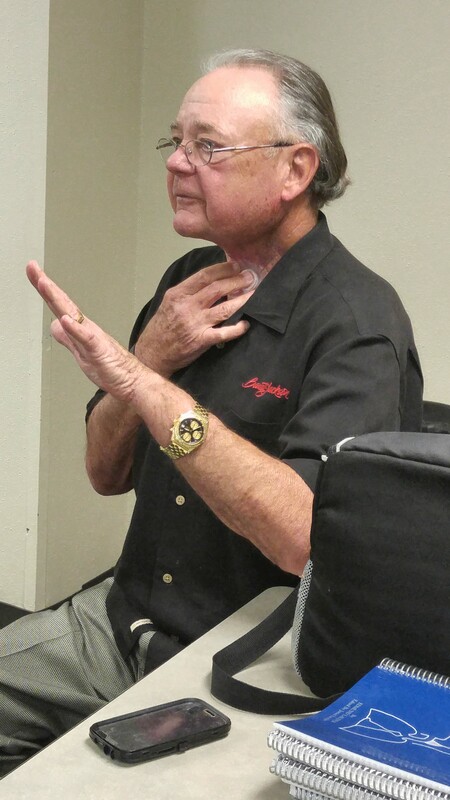 Frank providing a training class to Graduate Students at Baylor University School of Nursing. Frank Brick is a seven year Head and Neck Cancer Survivor. Frank was first diagnosed with Stage IV Throat Cancer in early 2011. Frank went through two months of Chemo and Radiation treatments and three Surgeries, including a Total Laryngectomy in early 2012. He has been cancer free for the past 7 years. Frank Brick is a seasoned and successful senior level executive who has lead four technology companies as CEO over the past 38 years. He has orchestrated three acquisitions and successfully sold two companies, delivering substantial returns to the shareholders. A Texas native, Frank began his career ‘traditionally’ by joining IBM in Dallas in 1970, following a combat tour in Vietnam with the US Army 1st Infantry Division in 1968. His early business roots were in systems engineering, sales, and product management. Early on, he decided to move towards a more ‘entrepreneurial’ environment and, following a successful 5-year stint at IBM, joined 4 other associates at Exxon Enterprise, the Venture Capital arm of Exxon, with 14 portfolio technology companies. At EEI in 1975, Frank helped start the National Sales Training Center for professional skills training and management development. He quickly rose to positions of Branch, District, and Regional Sales Management, relocating 5 times to positions of greater responsibilities. In1984, Frank followed the advice of a recruiter, interviewed with their company’s Chairman, and then joined Basicomputer as VP Sales & Marketing. This privately held company was a regional reseller of computer systems to businesses and individuals with $6MM in revenue in 1984. Within a year, Frank replaced the current President and was promoted to President/COO of the organization. He ultimately grew the organization to $225MM in revenue over the next 9 years. This revenue growth was the result of his transitioning the company from a PC focused reseller to a large account integration and network services provider. The company was ultimately sold in 1993. In 1993 Frank joined Telxon as VP Sales & Marketing. Telxon was a $280MM Publicly Traded wireless network integrator of customized hand held computers that provided mobile workforce automation. He quickly moved up in the organization assuming the position of President Telxon International in 1994, responsible for over 40% of the company’s total revenues. In June 1996, he was named President/COO then CEO in early 1997. Under Frank’s direction were 9 subsidiaries, 54 partners covering 60 countries with manufacturing locations in Houston, Texas and the Pacific Rim. Frank’s recipe for change included: creating a new strategic vision and developing programs that resulted in a complete company restructuring, driving costs out by consolidating operations. In less than a year he organized and implemented a complete restructuring of this $240MM information systems company including both systems and process changes in the area of manufacturing, distribution, logistics, channels, and field operations. Within five years Frank was responsible for growing Telxon from $245MM in revenue to a very profitable $480MM.Telxon was ultimately sold to a competitor for $28 per share, a 40% premium over its average daily trading price of $18 per share. After a short 2.5 year retirement and the stock market crash of 2001, Frank re-entered the market as Chairman and CEO of Arsenal Digital Solutions, a venture funded managed storage systems provider. When Frank joined Arsenal Digital the company had revenues of $3M while burning over $ 10M in cash the prior year. After his first year, Frank orchestrated the development of the first SAS (software as a service) delivery model which provided on-demand remote management of distributed storage systems. This new centralized automated solution allowed for the reduction of delivery cost by over 85%, generating gross profit margins in access of 65%. Focusing on large Enterprise customers with several remote locations, Arsenal Digital was able to profitably grow revenues to over $32M yielding operating profits of over $ 7M and $ 5M in free cash flow. With the agreement of the Board and majority shareholders, Frank delivered a successful liquidity event by selling Arsenal Digital Solutions to IBM’s Global Services Division in early 2008. The value of this transaction was almost 4 times revenues. In 2007, Frank was selected for the prestigious "Entrepreneur of the Year" award by Ernst & Young for his accomplishments, including: leading Arsenal Digital to its sixth consecutive year of double-digit revenue growth, guiding the company to 206 percent increase in data under management and customer deployments in 2006. Frank was elected the new Chairman at the business meeting on January 20, 2019.